Before I get to the answer, let’s run down exactly what being an Ambassador means and what you’re entitled to. If you purchase the 3DS before August 11th and perform a system update or sign into the eShop at least once by 11:59 PM on the 11th, you’re a Nintendo 3DS Ambassador. However, that also means that you bought the system at the full, original price (unless, of course, you scored it at a Walmart within the last day or so). To thank and console users like you, Nintendo is offering 20 free games starting September 1st. Only Ambassardors will be able to download the games for free, and 10 of the titles will never be offered to anyone else. If you do not have an eShop, that means you need to perform a system update. Do that by entering the System Settings, tap “Other Settings,” scroll all the way to the fourth page and select System Update. Follow the directions on the 3DS and then check your Ambassador status by following our directions above. This is the bit that’s still a little fuzzy. Nintendo indicates that Ambassadors will be given game download instructions as they become available. Well, they aren’t available yet. However, this free download period is supposed to begin on September 1st. Check back on or around that date and we’ll post download instructions then. 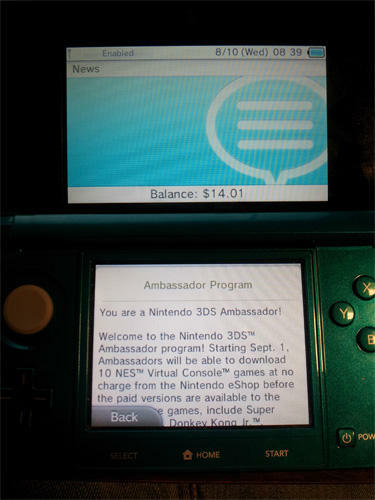 There it is, how to make sure you qualify for the Nintendo 3DS Ambassador program. If you have any other questions, try checking Nintendo’s official guide for this program. REMEMBER: You have until 11:59 PM on August 11th, 2011 (tomorrow night) to complete everything above in order to secure your Ambassador status. Do not forget to do it!